Cancer has continually been the leading cause of death worldwide for decades. Thus, scientists have actively devoted themselves to studying cancer therapeutics. Doxorubicin is an efficient drug used in cancer therapy, but also produces reactive oxygen species (ROS) that induce severe cytotoxicity against heart cells. Quercetin, a plant-derived flavonoid, has been proven to contain potent antioxidant and anti-inflammatory properties. 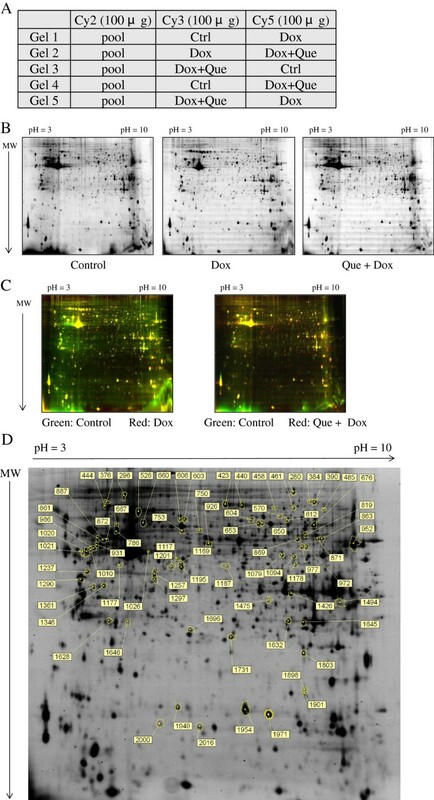 Thus, this in vitro study investigated whether quercetin can decrease doxorubicin-induced cytotoxicity and promote cell repair systems in cardiomyocyte H9C2 cells. Proteomic analysis and a cell biology assay were performed to investigate the quercetin-induced responses. Our data demonstrated that quercetin treatment protects the cardiomyocytes in a doxorubicin-induced heart damage model. Quercetin significantly facilitated cell survival by inhibiting cell apoptosis and maintaining cell morphology by rearranging the cytoskeleton. Additionally, 2D-DIGE combined with MALDI-TOF MS analysis indicated that quercetin might stimulate cardiomyocytes to repair damage after treating doxorubicin by modulating metabolic activation, protein folding and cytoskeleton rearrangement. Based on a review of the literature, this study is the first to report detailed protective mechanisms for the action of quercetin against doxorubicin-induced cardiomyocyte toxicity based on in-depth cell biology and proteomic analysis. Doxorubicin is a chemotherapy drug, commonly used in various cancer treatments, such as breast cancer, lung cancer and several other carcinoma types [1–3]. The principal mechanism of doxorubicin is chelating DNA, inhibiting topoisomerase II and then producing free radicals to kill cancer cells. Reported side effects of doxorubicin include cardiotoxicity, comprising cardiomyopathy and ultimately fatal congestive heart failure. Because myocardia are particularly sensitive to reactive oxygen species (ROS), cumulative doxorubicin in vivo causes irreversible damage to heart cells, thus restricting clinical use of this drug . Although the specific causal mechanism of doxorubicin-induced cardiotoxicity remains largely unclear, most of the evidence has indicated that doxorubicin is reduced to its semiquinone form by a mitochondria electron transport system. The semiquinone subsequently reacts with oxygen, iron, and hydrogen peroxide to produce ROS causing cell apoptosis and myocyte damage [5, 6]. In addition, global analysis of doxorubicin-induced cellular oxidative stress has indicated that doxorubicin treatment contributes to the over-expression of anti-oxidant proteins such as glutathione reductase and peroxiredoxin in brain cells, lung cells and heart cells [7–9]. Quercetin, a type of polyphenolic compound found in various plant products, possesses anti-oxidant, anti-proliferative, anti-inflammatory and anti-histamine properties. Several reports have indicated that quercetin exerts protective effects on various cells, including myocytes, testes, renal cells and liver cells in ischemia and reperfusion injury . A study conducted in 1992 determined that quercetin reduces the oxidative stress caused by ischemia and reperfusion in cardiomyocytes by inhibiting the xanthine dehydrogenase and xanthine oxidase system . Several reports have also indicated that quercetin and isorhamnetin scavenge ROS and inhibit the activation of ERK and MAP kinase in ROS-induced cardiomyopathy [12, 13]. In cancer therapy, combining quercetin with doxorubicin augmented the effects of doxorubicin in highly invasive breast cancer cells  and can protect cardiomyocytes from doxorubicin-induced toxicity by chelating iron, inducing antioxidant activity, and inhibiting carbonyl reductase . Regarding proteomic analysis, the results also indicated that quercetin could down-regulate Ras GTPase-activating-like proteins and heat shock protein-90 to reduce cell migratory ability and cell survival, respectively, in malignant cancers [16, 17]. Although quercetin has been reported to play a role in protecting myocardial cells from ischemia and reperfusion injury, its protective mechanism remains unclear. To investigate the role of quercetin in alleviating doxorubicin-induced cardiotoxicity, we examined the protective ability of quercetin in doxorubicin-treated rat cardiomyocytes by performing cell biological assays, such as cell viability and apoptotic analysis, as well as a quantitative proteomic analysis based on 2D-DIGE and MALDI-TOF MS identification . Generic chemicals were purchased from Sigma-Aldrich (St. Louis, USA), while reagents for 2D-DIGE were purchased from GE Healthcare (Uppsala, Sweden). All primary antibodies were purchased from Genetex (Hsinchu, Taiwan) and anti-mouse, and anti-rabbit secondary antibodies were purchased from GE Healthcare (Uppsala, Sweden). All the chemicals and biochemicals used in this study were of analytical grade. The rat cardiomyocyte cell line H9C2 was purchased from American Type Culture Collection (ATCC) (Manassas, VA) and was maintained in Dulbecco’s modified Eagle’s medium (DMEM) supplemented with 10% (v/v) FCS, L-glutamine (2 mM), streptomycin (100 μg/mL) and penicillin (100 IU/mL) (all from Gibco-Invitrogen Corp., UK). Cells were incubated in a humidified incubator at 37°C and 5% CO2. and passaged at 80-90% confluence by trypsinization according to standard procedures. The detailed MTT experimental procedure has been described in our previous study . Cells were plated onto coverslips (VWR international) for overnight incubation and subsequently fixed with PBS containing 4% (v/v) paraformaldehyde for 25 min. After washing three times in PBS, samples were permeabilized in PBS containing 0.2% (v/v) Triton X-100 for 10 min. and then rinsed and blocked in PBS containing 5% (w/v) BSA for 10 min prior to incubate with primary antibodies diluted in 2.5% BSA/PBS for 1 h. After PBS washings, samples were incubated with the appropriate fluorescently labeled secondary antibodies diluted in 2.5% BSA/PBS for 1 h. Samples were then washed three times with PBS and briefly rinsed with ddH2O twice before applying to Vectashield mounting medium (Vector Lab). Coverslip edges were sealed with nail polish onto glass slides (BDH) and then air-dried in the dark at 4°C. For image analysis, cells were visualized using a Zeiss Axiovert Z1 fluorescent microscope (Carl Zeiss Inc., Germany). Identical laser intensities were used to detect the same immunostained proteins to obtain non-saturated images. Images were exported as .tif files using the Zeiss Axioversion 4.0. Annexin-V/propidium iodide (PI) double assay was performed using the Annexin V, Alexa Fluor® 488 Conjugate Detection kit (Life technologies). Following doxorubicin treatment, cells were typsinized from culture dish and washed twice with cold PBS. 1 × 106 cells were resuspended in 500 μL binding buffer and stained with 5 μL Alexa Fluor 488 conjugated annexin V according to the manufacturer’s instructions. 1 μL 100 μg/mL propidium iodide (PI) was mixed gently to cells for 15 min at room temperature in the dark. After incubation period, samples were subjected to FCM analysis in 1 h. using BD Accuri C6 Flow Cytometry (BD Biosciences, San Jose, CA). The data were analyzed using Accuri CFlow@ and CFlow Plus analysis software (BD Biosciences). Immunoblotting analysis was used to validate the differential abundance of mass spectrometry identified proteins. The detailed experimental procedures were described in our previous reports [20–22]. All primary antibodies used for expression validation were purchased from Genetex (Hsinchu, Taiwan). The detailed experimental procedures have been described in our previous publications [23–25]. Notably, peaks in the mass range of m/z 800-3000 were used to generate a peptide mass fingerprint that was searched against the Swiss-Prot/TrEMBL database (released on August 2011) with 531473 entries using Mascot software v2.3.02 (Matrix Science, London, UK). The parameters used for Mascot search are listed: mouse; tryptic digest with a maximum of 1 missed cleavage; carbamidomethylation of cysteine, partial protein N-terminal acetylation, partial methionine oxidation and partial modification of glutamine to pyroglutamate and a mass tolerance of 50 ppm. Identification was accepted based on significant MASCOT Mowse scores (p < 0.05), spectrum annotation and observed versus expected molecular weight and pI on 2-DE as well as at least 5 peptides in each identified protein. To evaluate the effect of doxorubicin on rat cardiomyocytes (H9C2), we exposed the cells to doxorubicin in a range of 0-1 μM for 24 h in a serum-free medium. 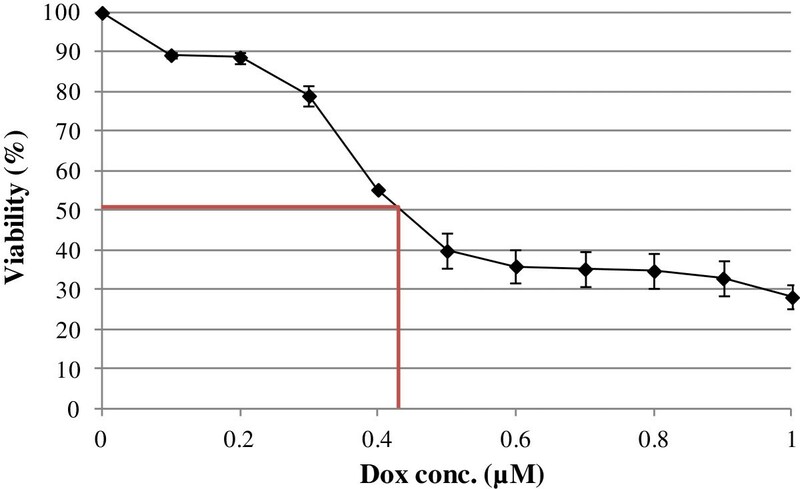 After exposure to doxorubicin, dose dependent loss of cell viabilities was observed in the H9C2 cells in 3 independent experiments using MTT assays (Figure 1). At a concentration of 0.45 μM, a significant loss (50%) of cell viability was detected after 24 h. To verify the role of quercetin regarding the recovery of doxorubicin-induced cardiomyopathy, we investigated the changes in cell viability in the H9C2 cells incubated in 0 μM, 50 μM, 100 μM, 150 μM and 200 μM quercetin for 4 h, followed by 24 h-exposure to 0.45 μM doxorubicin. Our results demonstrated that cell viability was significantly improved using quercetin in concentrations from 50 to 200 μM (Figure 2A). Effect of doxorubicin treatment on H9C2 cell viability. H9C2 cells were treated with indicated concentrations of doxorubicin from 3 independent experiments. Cell viability was determined by MTT assay after 24 h exposure of doxorubicin. Each data point indicates mean ± SD of triplicate values. Effects of quercetin on doxorubicin-induced changes of cell viability, cell apoptosis and cell morphology in H9C2 cells. (A) MTT-based viability assays were performed on H9C2 cell cultures following treatments with different concentrations of quercetin (50 μM, 100 μM, 150 μM and 200 μM) or left untreated. Values were normalized against untreated samples and were the average of 4 independent measurements +/- the standard deviation. The statistic analysis was performed with two group paired Student t-test. (B) Typical dot plot diagrams detected annexin V-FITC and PI staining represent untreated, doxorubicin-treated, and quercetin-pretreated followed by doxorubicin–treated cells. The x-axis and y-axis stand for the intensity of annexin V-FITC and PI, respectively. The lower left area of presented background staining by annexin V-FITC and PI in normal cells, and apoptotic signals located in the right area. This figure is representative of 4 replicates. The statistic analysis of the replicates was listed in right panel. (C) The levels of caspase 3 and caspase 9 in H9C2 cells were detected by immunoblotting. GAPDH served as a sample loading control. 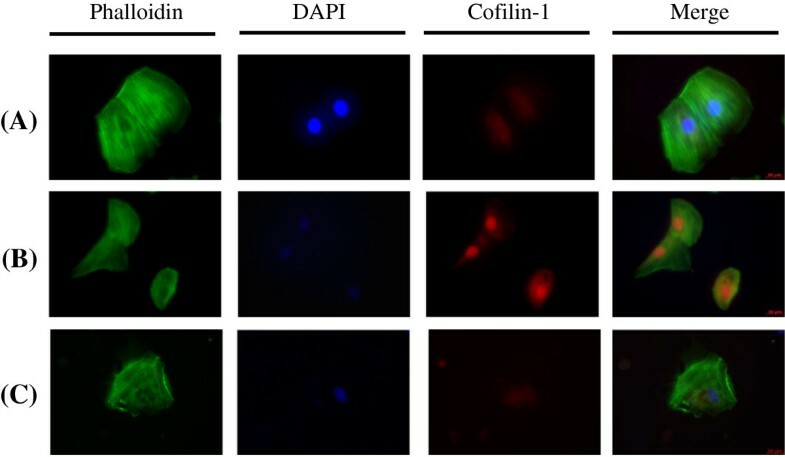 (D) Cell morphology and protein location of F-actin in H9C2 cells were analyzed by immunostaining. H9C2 cells on coverslips were either left untreated, treated with doxorubicin or pre-treated with quercetin prior to doxorubicin treatment before fixation and staining. F-actin was stained with phalloidin and nuclei were stained with DAPI. Each set of five fields were taken using the same exposure and images are representative of five different fields. In (B) ~ (D), H9C2 cells were untreated, 0.45 μM of doxorubicin for 24 h, or 100 μM of quercetin for 4 h followed by 0.45 μM of doxorubicin for 24 h.
Because excess ROS stress from doxorubicin-treated cardiomyocyte alters redox homeostasis and induces cell death, cell apoptosis was further detected using FACS. During cell apoptosis, phosphatidylserine is translocated to the outer surface of the plasma membrane, which has a high affinity to annexin V-FITC, and PI can penetrate the cell nucleus. As shown in Figure 2B, the apoptotic rate increased from 4.9% to 61.4% after doxorubicin treatment, whereas the apoptotic rate decreased to 9.5% after the H9C2 cells were pretreated with quercetin before doxorubicin treatment. In addition, the levels of the proteolytic enzymes, caspase 9 and caspase 3, were detected using immunoblotting in control, doxorubicin-treated and quercetin-pretreated H9C2 cells. Figure 2C indicates increased expression levels of the apoptosis factors for caspase 3 and caspase 9 after doxorubicin treatment. Quercetin protected the H9C2 cells from doxorubicin-induced cell injury by inhibiting the expressions of caspase 3 and caspase 9. Additionally, immunostained images of F-actin indicated that doxorubicin treatment affected cytoskeletal protein reorganization, causing cell morphology alternation (Figure 2D). Therefore, quercetin pretreatment is essential to maintaining doxorubicin-induced morphological changes. To fully understand the roles of doxorubicin and quercetin pretreatment in H9C2 cells, lysates of cells untreated, treated with doxorubicin, or treated with doxorubicin after pretreatment of quercetin, were subjected to 2D-DIGE analysis. The results of the 2D-DIGE analysis and DeCyder processing identified 2156 protein spots, and 73 proteins exhibited differential expression (≧ 1.5 fold or ≦-1.5 fold; p < 0.05) among the 3 conditions (Figure 3). Additional file 1: Table S1 shows the 73 proteins that were identified using MALDI-TOF MS, and 31 of the 73 identified protein spots that displayed doxorubicin-dependent alteration can be reversed by pretreating with quercetin (Additional file 1: Table S1 and Additional file 2). For example, the 78 kDa glucose-regulated protein (GRP-78) (No.444) was up-regulated (1.63 fold) in the doxorubicin-treated cells, whereas quercetin reduced the overexpression of doxorubicin-treated GRP-78 (-1.85 fold). The result suggested that the protective mechanisms of quercetin significantly altered the levels of chaperone proteins during doxorubicin-treatment in the cardiomyocytes. Figure 4A shows the functional distribution of the identified proteins from the 2D-DIGE results. 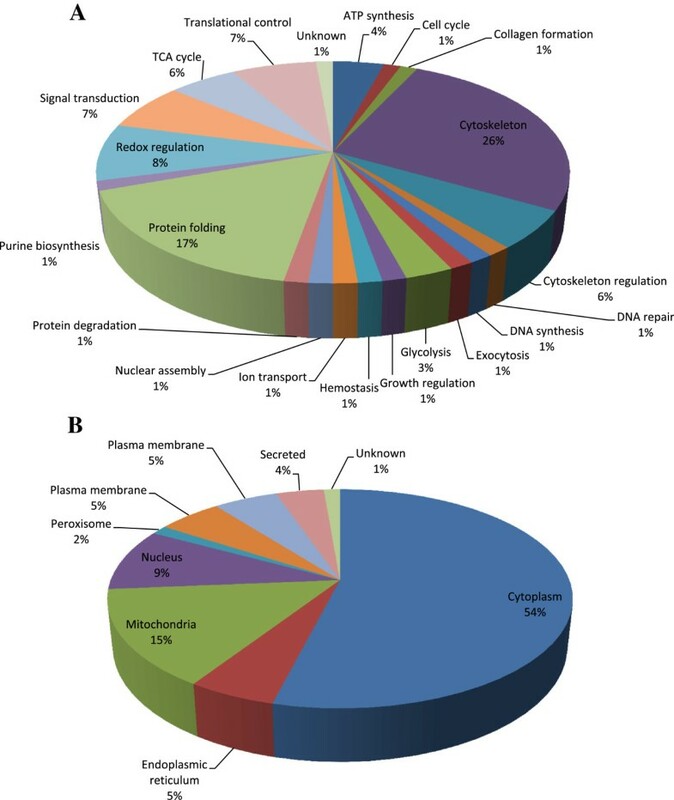 Most of the proteins identified using MALDI-TOF MS were associated with the cytoskeletal element and cell migration as well as protein biosynthesis and metabolism, implying that quercetin is crucial for sustaining cytoskeletal and metabolic alternations responding to oxidative damage in the cardiomyocytes. During doxorubicin-mediated cardiomyopathy, the majority of the identified proteins were located in the cytoplasm and the nucleus (Figure 4B). 2D-DIGE analysis of H9C2 cells in response to doxorubicin treatment and pre-treatment with quercetin. (A) Samples arrangement for a triplicate 2D-DIGE experiment. (B) Protein samples (100 μg each) were labeled with Cy-dyes and separated using 24 cm, pH 3-10 non-linear IPG strips. 2D-DIGE images of the protein samples from H9C2 cells in response to doxorubicin treatment and pre-treatment with quercetin at appropriate excitation and emission wavelengths were shown as well as overlaid pseudo-colored images processed with ImageQuant Tool (GE Healthcare) (C). (D) Protein samples (100 μg each) purified from total cell lysates were labeled with Cy-dyes and separated using 24 cm, pH 3-10 non-linear IPG strips. The differentially expressed protein features were annotated with spot numbers. In this 2D-DIGE experiment, H9C2 cells were untreated, 0.45 μM of doxorubicin for 24 h, or 100 μM of quercetin for 4 h followed by 0.45 μM of doxorubicin for 24 h.
Percentage of total differentially expressed proteins identified by 2D-DIGE/MALDI-TOF MS for H9C2 cells in response to doxorubicin treatment and pre-treatment with quercetin according to their biological functions (A) and sub-cellular locations (B). The levels of aconitase, ATP synthase, carbonic anhydrase, GRP78, HSP27, HSP60, peroxiredoxin 6, tropomyosin 4, vimmentin and cofilin-1 were examined using immunoblotting and immunostaining to validate the results of the 2D-DIGE analysis. The results indicated that aconitase, ATP synthase, GRP78, HSP60, peroxiredoxin 6, tropomyosin 4 and cofilin-1 were overexpressed in response to doxorubicin. 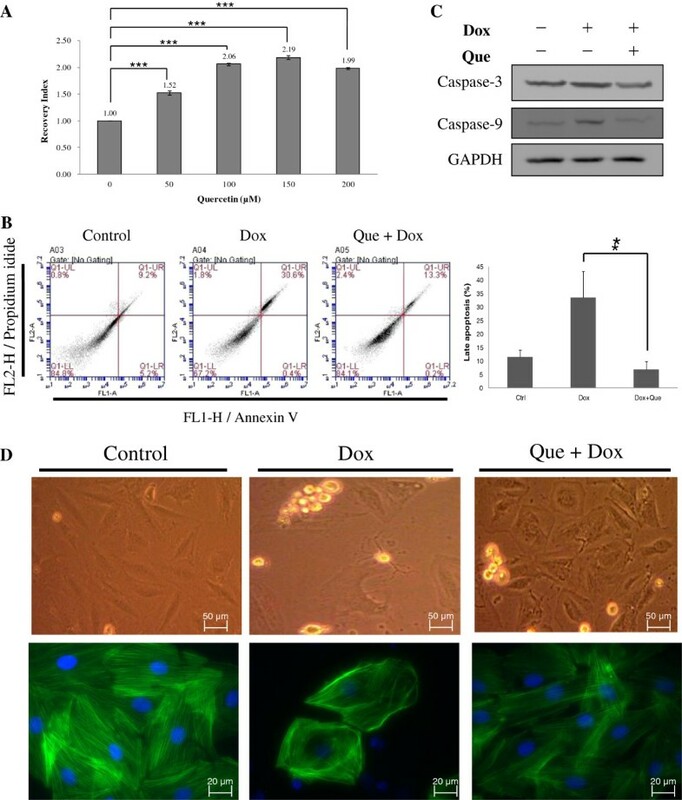 However, quercetin suppressed the expression of the proteins during doxorubicin treatment in the H9C2 cells (Figure 5 and Figure 6). These results are consistent with the 2D-DIGE results. Representative immunoblotting and immunofluorescent analyses for selected differentially expressed proteins identified by proteomic analysis of H9C2 cells in response to doxorubicin treatment and pre-treatment with quercetin. The levels of identified proteins, (A) Aconitase, (B) ATP synthase, (C) Carbonic anhydrase, (D) GRP78, (E) HSP27, (F) HSP60, (G) Peroxiredoxin 6, (H) Tropomyosin 4, (I) Vimmentin, in H9C2 cells in response to doxorubicin treatment and pre-treatment with quercetin were confirmed by immunoblot, while GAPDH was used as loading controls (left panels). The protein expression maps and two-dimensional spot images were shown in right panels and middle panels, respectively. (J) H9C2 cells in different treatment conditions were fixed and incubated with anti-Cofilin-1 antibody (Red) and stained with Phalloidin (Green). Nucleus were stained with DAPI (Blue). Each set of three fields was taken using the same exposure, and images are representative of three different fields. In this validation experiment, H9C2 cells were left untreated, treated with 0.45 μM doxorubicin for 24 h or pretreated with 100 μM quercetin for 4 h followed by 0.45 μM doxorubicin for further 24 h.
Representative immunofluorescent analyses for Cofilin identified by proteomic analysis of H9C2 cells in response to doxorubicin treatment and pre-treatment with quercetin. H9C2 cells in different treatment conditions were fixed and incubated with anti-Cofilin-1 antibody (Red) and stained with Phalloidin (Green). Nucleus was stained with DAPI (Blue). Each set of three fields was taken using the same exposure, and images are representative of three different fields. In this validation experiment, H9C2 cells were left untreated, treated with 0.45 µM doxorubicin for 24 h or pretreated with 100 µM quercetin for 4 h followed by 0.45 µM doxorubicin for further 24 h.
Myocardial damage induced by doxorubicin was primarily caused by chelating DNA, inhibiting topoisomerase II and producing free radicals. Based on these concepts, numerous studies have evaluated the effects of doxorubicin-induced toxicity and the mechanisms that contribute to protecting cardiomyocytes [26–28]. In our previous studies, we reported on the cellular oxidative targets during heart damage induced by doxorubicin . Additionally, we demonstrated that quercetin might dephosphorylate Src kinase activity in ROS-induced H9C2 cells and block ROS-induced inflammatory responses through STAT3 kinase. These activities contribute to preventing ischemia and reperfusion injury in cardiomyocytes . In this study, we determined that quercetin treatment protected cardiomyocytes in the doxorubicin-induced heart damage model. Moreover, quercetin significantly facilitated cell survival by inhibiting cell apoptosis and maintaining cell morphology by inducing cytoskeletal protein rearrangement. Furthermore, after the proteomic analysis, we observed dramatic reductions in the H9C2 proteins involving protein folding, redox-regulation, and energy metabolism, as well as significant increases in proteins involving cytoskeleton and cytoskeleton regulatory proteins among the lysates of cells that were untreated, treated with doxorubicin, or treated with doxorubicin after pretreatment with quercetin. We suggest that cardiomyocytes develop defense mechanisms to overcome doxorubicin-induced ROS accumulation, which causes cell damage and cell death. The defense mechanisms include the overexpression of redox-modulated proteins to scavenge doxorubicin-induced ROS. In this study, pretreating with quercetin might scavenge ROS, diminishing oxidative stress and subsequently downregulating redox-regulatory proteins including glutamate dehydrogenase 1, isocitrate dehydrogenase, NADP-dependent malic enzyme, retinal dehydrogenase 1 and peroxiredoxin-6. Moreover, we also observed that most proteins critical for modulating protein folding were down-regulated during pretreatment with quercetin which might account for the decreased concentrations of ROS causing the decrease of incorrectly folding proteins and attenuating the expression of chaperone proteins such as 60 kDa heat shock protein, 78 kDa glucose-regulated protein, alpha-crystallin B, heat shock protein beta-1, Stress-induced-phosphoprotein 1 and T-complex protein 1. Similar results have been reported in ethanol- and arsenite-induced oxidative stress, which caused over-expression of anti-oxidative stress proteins. However, the over-expression was significantly alleviated by quercetin pre-treatment [31, 32]. In addition to these studies, the quercetin-induced downregulation of the protective proteins might account for the quercetin-treated cells exhibiting higher sensitivity to ROS damage, such as cancer cells [33, 34]. Several key regulatory proteins mediated the interaction of heat shock proteins to inhibit apoptosis. The intrinsic pathway of caspase-mediated apoptosis was stimulated by c-Jun kinase, resulting in the release of cytochrome c from the mitochondria, and the subsequent activation of a caspase cascade involving caspase 8 and caspase 3. They were each inhibited by heat shock cognate 71, which interacted with Bcl-2 through Bag-1, enabling the complex to be incorporated into the mitochondrial membrane to inhibit apoptosis . 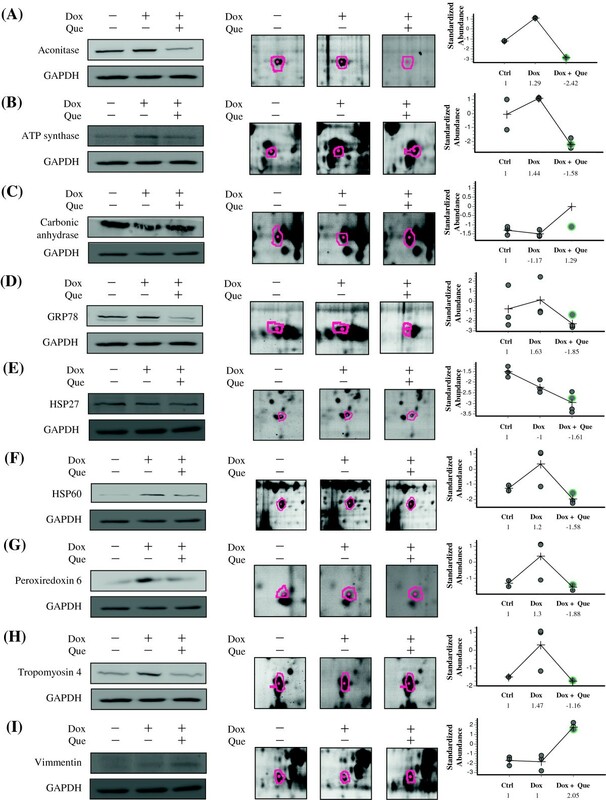 In this study, heat shock cognate 71 was upregulated in the quercetin-pretreated H9C2 cells, implying that heat shock cognate 71 is essential for protecting H9C2 cells from doxorubicin-induced apoptosis. Quercetin was also observed to modulate the expression of cytoskeletal proteins (e.g., tubulins) and migration-regulated proteins (e.g., tubulin polymerization-promoting proteins) after encountering doxorubicin-induced damage . Our immunofluorescence study demonstrated that quercetin can promote F-actin organization. Proteomic data also suggested that actin molecules were overexpressed during quercetin pretreatment, implying that quercetin causes the efficient regulation of protrusion dynamics and the wound healing of doxorubicin-damaged cardiomyocytes. Our proteomic analysis indicated that quercetin pretreatment might down-regulate the levels of proteins involving energy metabolism including mitochondrial ATP synthesis, glycolytic proteins and TCA cycle proteins. Similar results were also reported by Dihal et al., who observed that glycolytic proteins were significantly down-regulated in their report. Additionally, Shoshan et al. reported that quercetin can modulate mitochondrial energy production by interacting with ATP synthase and blocking the enzyme’s activity [37, 38]. The current proteomic analysis corresponded with these results. Our preliminary data indicated that quercetin reduces but enhances the cytotoxicity of doxorubicin on cardiomyocyte H9C2 cells and liver cancer HepG2 cells, respectively (data not shown). This observation suggested the potential of combining quercetin and doxorubicin for treating liver cancer. Although no direct evidence indicates the cooperative effect of quercetin and doxorubicin on other cancer treatment, performing relevant evaluations of other cancers is worthwhile in the future. In summary, this study is the first to report on the principle mechanism of quercetin against doxorubicin-induced cytotoxicity in cardiomyocytes, using cell biology and a quantitative proteomic analysis. The information obtained in this study presents the potential of combining quercetin with doxorubicin to achieve reduced cardiotoxicity in cancer chemotherapy. This study is the first to report detailed protective mechanisms for the action of quercetin against doxorubicin-induced cardiomyocyte toxicity. Quercetin might stimulate cardiomyocytes to repair damage after treating doxorubicin by modulating metabolic activation, protein folding and cytoskeleton rearrangement. Matrix assisted laser desorption ionization-time of flight mass spectrometry. HCC designed the experiments and wrote the drafting manuscript. JYC, RYH performed the cell culture, 2D-gel electrophoresis, image analysis, cell biological analysis and immunoblotting. HCC supervised the experiments and the data analysis and finalized the manuscript. All authors have read and approved the final manuscript.